Tuesday has never been this slow. My precious hours alive are wasted by just being on the road! Traffic greeted me the sunniest "Good morning". 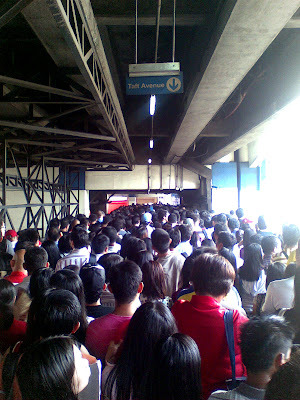 The MRT was a drag. These are nothing new but today was a different animal. I know I shouldn't be complaining since it's really my choice to commute. But what about the others who have no other sound option? We deserve better. If only commuting wasn't as draining and time consuming, we'd all be more productive, peaceful and happy.